He couldn’t put the brakes on his aggressive stroke-play. Indian batsman Rohit Sharma found himself on the right side of luck as he was included in the 12-man squad for the ongoing Test against Australia at Adelaide Oval. To add to his delight, the 31-year-old managed to break into the playing eleven. The pitch didn’t seem to have any demons and the Mumbai batsman had a golden opportunity to get a substantial score under his belt. After the visiting team won the toss and elected to bat first, the Aussie pacers- Pat Cummins, Josh Hazlewood, and Mitchell Starc– got India by the scruff of their necks, having reduced them to 41/4 in the 21st over. Rohit had a tough challenge ahead of him to take his team out of the pits. He looked more than decent during his stint in the middle and scored 37 from 61 deliveries. He put his head down initially and gradually stepped on the gas. In the 26th over, he took on a short delivery from Pat Cummins and carted him over deep square leg. A few overs later, Rohit smacked him for another massive blow. 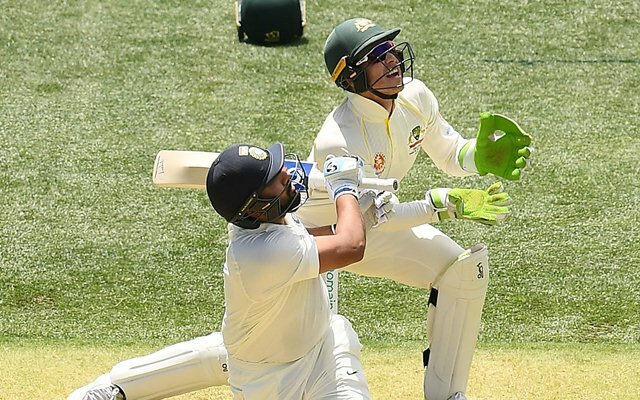 However, he couldn’t put the brakes on his aggressive stroke-play and eventually fell prey to a rather horrendous stroke off off-spinner Nathan Lyon. He got a reprieve in the 38th over, when Marcus Harris couldn’t hold on to the ball and the leather sailed over the ropes for a six. In the very next delivery, he went for another outrageous stroke over the same region. Lyon gave the ball a fair amount of flight and Rohit danced down the track. However, the batsman was beaten in the air and he couldn’t make a proper connection. At the point of contact with the willow, the ball wasn’t destined to clear the boundary ropes. This time around, Harris came running around from the boundary and settled himself under the ball. To the Aussies’ relief, Harris didn’t fumble and Rohit had to make the long walk back. It also brought to an end the decent 45-run stand between Rohit and Cheteshwar Pujara.